We are now planning for several different events, but especially for our next campaign in Zambia, which will take place from the 8th – 11th of August 2019. The place we are going to is called Mpulungu, a small town in the north eastern part of Zambia close to the border of Tanzania. 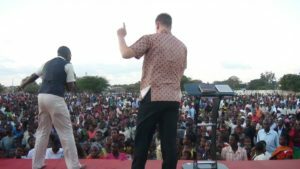 Mpulungu has a growing Muslim population and is a strategically important place in order to reach the north eastern part of Zambia with the Gospel. The majority of the population are Christian, but few of those who regard themselves as ”Christians” are born-again. Our wish is that Jesus can come with His freedom – not only to people from other religions – but also to those who belong to the Christian religion. We believe that religion binds people up and brings them into captivity, while the Gospel of grace sets people free. This will be a 4-day evangelistic outreach with focus on salvation and healing, combined with a seminar for pastors and believers about the revelation of God’s grace and the new covenant. The reason why we go public with this event already now is that we need to raise about 10.000 USD to cover the expenses for the campaign. Among the bigger expenditures are costs for stage, sound, and marketing of the event. That our small and relatively newly started organization would be able to raise the needed money indeed feels far-fetched, but we know that with God nothing is impossible! 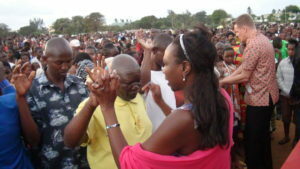 He is able to speak to people’s hearts to give towards Gospel advancement. Thanks for standing with us in proclaiming the Gospel of grace!